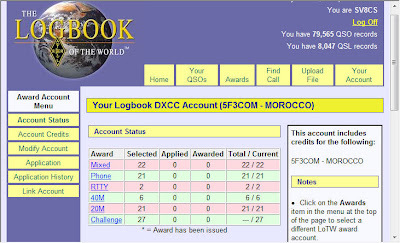 Morocco contest team IK2QEI - IK2SGC - SV8CS with the special and contest calls CN3A - 5D5A - 5F3COM, now we have uploaded our contest and dx pedition qso's to the LoTW. 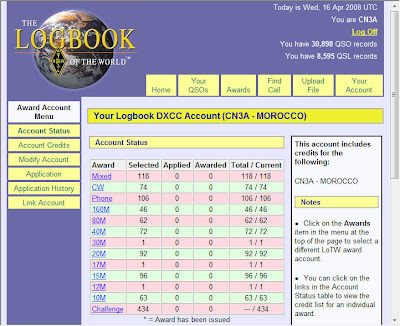 CN3A has now in the LoTW 30.898 QSO records, with 8.595 QSL records, included all qso's made via EME in 6m and 2m with digital modes (JT65B-JT65A-FSK441). For 5F3COM, (special call), there are at about 2.000 QSO's uploaded in the LoTW. The 5D5A logs are NOT in the LoTW now, but we will upload the qso's with this call very soon. Thank you for the qso's and see you next contest from CN3A.